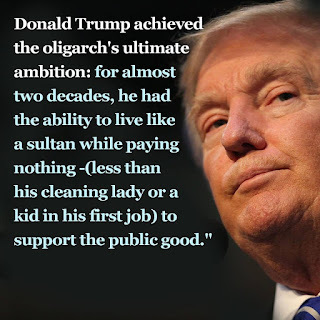 Trump himself is an oligarch - and it has nothing to do with being "rich" or whatever. Oligarchy goes deeper than that. He is financed by a number of oligarchs and financiers: the likes of the Zionist billionaire Sheldon Adelson, who has funded his super PACS to the tune of over $100 million. The CEO of his campaign is the former Goldman Sachs banker Stephen Bannon (also a leading light of the controlled-opposition Alt-Right movement). His economic advisors include the ruthless "corporate raider" Carl Icahn, named among "the world's 50 richest Jews" by the Jerusalem Post, who Trump has already said would be appointed Treasury Secretary. And they include the ruthless banker and apartment slum lord Steven Mnuchin, who worked at Goldman Sachs for 17 years and, as head of the Soros-controlled OneWest Bank, stole millions from people he cruelly threw out on the street because their ends' meet wasn't enough to satisfy his greed. His team of economic advisors also include John Paulson, CFR member and former hedge-fund manager who made billions speculating on the housing market; Stephen Calk, founder of the Federal Savings Bank who previously worked for Chase Manhattan Corp. and the infamous Bank of America; Wilbur Ross, the billionaire who spent 25 years running Rothschild Inc's bankruptcy practice; and Steve Feinberg, co-founder and CEO of the hedge fund Cerberus Capital Management, L.P..
Another Trump backer is the billionaire Stewart Rehr, who made his fortune in Big Pharma and who is the 183rd richest man in America. And they also include Bennett LeBow, who made a fortune off a luxury hotel deal in the Ukraine with close connections to Jewish mobster Vadim Rabinovich and with his business partner being Ronald Lauder, who was simultaneously heir of the cosmetics company Estee Lauder, U.S ambassador to Austria and president of the World Jewish Congress. As for the Neocons, then they have split. While Robert Kagan, Max Boot and Victoria Nuland have been close foreign policy advisors to Hillary Clinton, including during her time in the State Department, Trump has earned the endorsement of the "father of Neoconservatism," co-founder of the Project for the New American Century (PNAC) Norman Podhoretz. Other Neocons are among Trump's foreign policy advisors: Joseph Schmitz, former Blackwater executive and fellow at the Centre for Security Policy, the rabidly Zionist think-tank funded by war-profiteers Raytheon and Lockheed Martin; and Joseph Keith Kellogg, former Chief Operating Officer (COO) at the war-profiteering Oracle Company and COO of the Coalition Provisional Authority of Iraq from 2003 to 2004. Copyright © National-Anarchist Movement. All rights reserved.